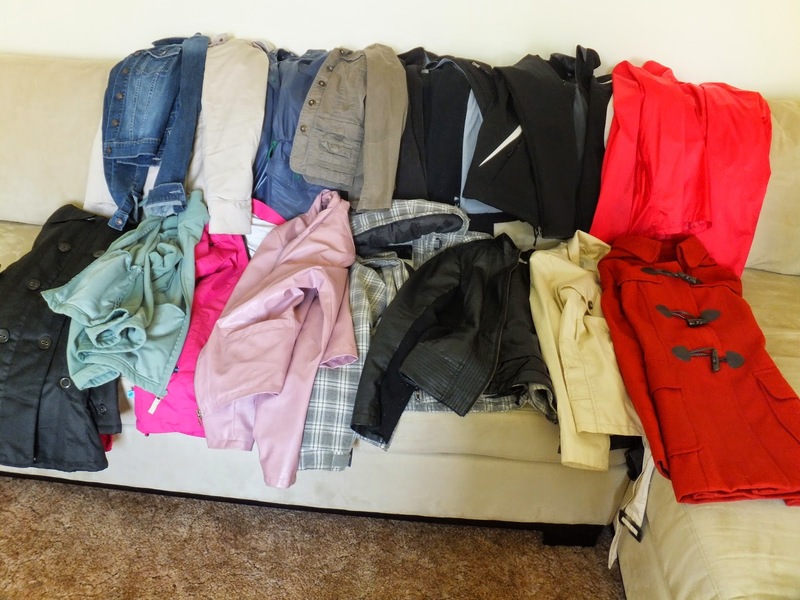 Peaceful Simple Life: Minimalism Week #1-A Closet Filled with Coats and Shoes! Minimalism Week #1-A Closet Filled with Coats and Shoes! I plan to chronicle my journey to minimalism on this blog. I was grappling with where to start. With a three month old, my time for minimizing is limited to my daughter's naps, which can be short. I have decided to go through my home bit by bit. I won't be doing whole rooms at once, as I don't have the time to commit to that sort of project! I decided to start with our outdoor closets. We have two in our home. The other day my hubby was searching for something in the closet when he turned to me and asked, "Do you really need this many coats?". It was a question born out of frustration. I take up more than my fair share of the closet. Even though I knew he had a point, I got my back up. I started to defend my different coats, when he asked about my navy blue rain jacket. I own three rain jackets and this particular one is over 14 years old. I was in junior high when I got it! I guess I have a bit of a coat hoarding problem! Today, I pulled out all of my jackets, coats and shoes. I lined them up and then began to decide what to keep. I referred to un-fancy.com, a blog where the author does a "capsule wardrobe". She only keeps two jackets/coats per season so I decided to follow suit. She keeps nine pairs of shoes per season, however, which is far too many for me! For the footwear, I kept only what I wear regularly. There were three rain jackets (a little redundant, don't ya' think? ), two jackets that don't fit anymore, and more than one khaki coat, among others. 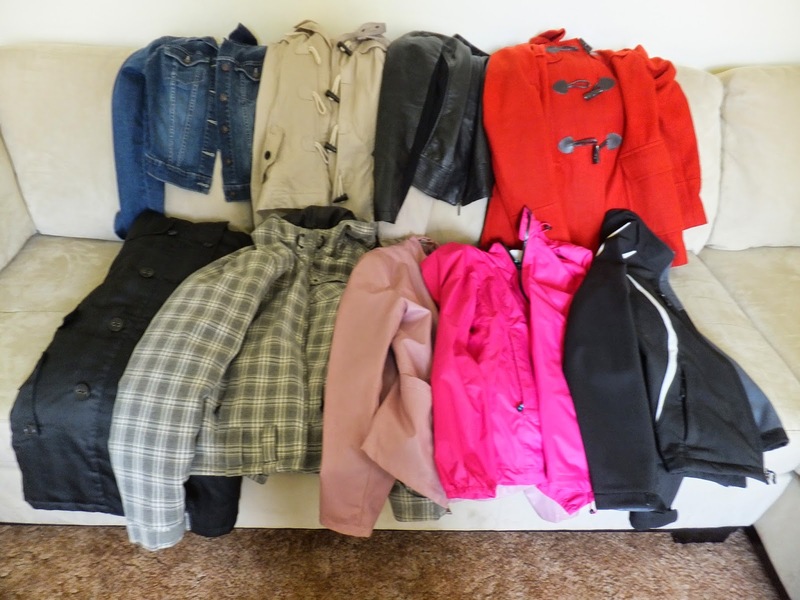 I kept my pink pleather jacket and pink rain jacket for the Spring, my jean jacket and khaki toggle coat for the Summer, orange toggle coat and black pleather jacket for the Fall, and my black winter coat and plaid ski jacket for Winter. I kept one additional coat for camping and playing with the dog. I don't like to use my "good" coats for camping, as the campfire seems to always throw a spark in my direction! I have stored away my Fall and Winter jackets until those seasons arrive. I will put my Spring/Summer coats in the storage container when I take out the Fall/Winter jackets. In that collection I had two pairs of rubber boots (I have a thing for rain gear, apparently! ), five pairs of flip-flops, several pairs of boots, four pair of heels, several pairs of flats (two that I never wear!) and three pairs of wedges. It dawned on me that I own a LOT of warm weather footwear for someone who lives in the Great White North! Winter honestly lasts six months here and I have an abundance of shoes for the two months of Summer that we get! I forced myself to only keep what I will and can wear. It kind of pains me to let go of my "pretty" shoes (the glitter heels and gold wedges) but they deserve to be worn. Shoes aren't meant to rot away in the closet. I placed all of my unwanted footwear in the donation pile. I also kept my winter storm boots (good for deep snowbanks and frigid temperatures) and my running shoes. I didn't show them because they have pretty specific uses and I had no intention of getting rid of them. It feels so good to have those closets cleaned out! I know my husband will be happy to find more space in our outdoor closets! I love getting rid of the items I no longer use or need. It makes me feel lighter and happier. I like donating the items that are in good shape to a local second-hand store. The profits from this store support the local women and children's shelter. I just want to give a quick word about donating items. Please make sure that the items you are donating are clean (they should go through the washing machine!) and in good repair. You don't want to burden the donation places with items that they have to throw in the trash. I once bought a box of second-hand maternity clothes. When I got home I found deodorant all over the armpits of some of the shirts. Ewwww! Knowing the seller, it didn't bother me too much but I threw the items in the washing machine before I wore them! Don't be that person! Take the extra time to wash and clean items before they go to their next home! Have you gone through any of your closets lately? Have you been surprised at what's in there? How do you decide what to keep and what to get rid of? Let me know! A Return to Blogging & High Five for Friday!